The museum, which can be entered directly from the church, is found in a series of three small elegant halls, characterized by the passage doors with beautiful 16Th century jambs in gray sandstone that bear the date “15..”. Vigorously supported by the provost, Father Renzo Mazzoni (1977-1984), a man also of great culture, the museum was inaugurated in 1983. It can be considered the first of its kind in the Florentine Upper Valdarno, in reality a forerunner since, at that time, the idea of concentrating and promoting artistic assets locally, i.e., the idea behind the various “little big museums” had not yet totally matured and would be systematically carried out much later. The structure was updated both technological and from an exhibition point of view for the 2007 show “Renaissance in the Valdarno”, with the assistance of the Ente Cassa di Risparmio and the parish, overseen by Monsignor Manlio Tinti since 1984. 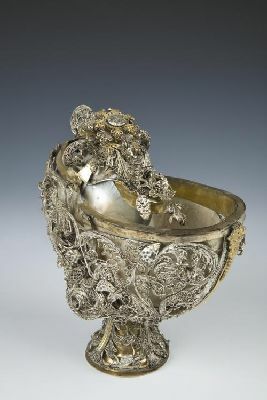 The museum contains valuable silver works and liturgical furnishings belonging to the collegiate church, with some important donations from the antique dealer Giovanni Pratesi. Beautiful sacred vestments and hangings from the church’s rich endowment, antiphonaries with treasured 16th-century illuminations, and a complete and rare series of processional insignia with symbols of the Passion in carved and painted wood are displayed on a rotating basis. One of the paintings to be pointed out is Ludovico Cigoli’s (1559-1613) Martyrdom of Saint Lawrence, from 1590. 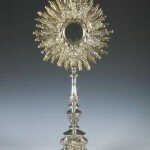 Created for the church of the Company of San Lorenzo of the Ospedale Serristori in Figline, it was acquired by the Medicis in 1733 and later became part of the Florentine museum patrimony. Indeed, it is a loan from the Florence Superintendency. The two triangular panels with two angels, added at the end of the 15th century, are also to be admired here. 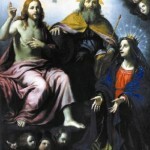 As was the custom at the time, they were placed to the sides of the cusp of the altarpiece by the Master of Figline in order to give the painting a rectangular shape. They were later re-discovered under a layer of azure paint and then removed so as to return the painting to its original shape. Previously attributed to Domenico Ghirlandaio, they have recently been assigned to Bartolomeo di Giovanni, one of that master’s assistants. The large partially glazed terracotta depicting Saint Joseph by Luca the Younger or Bartolomeo, the sons of Andrea della Robbia (ca.1505-1510), was also transferred here from the nearby modern Chapel of the Holy Sacrament. Other works recently been added to the museum’s exhibition did not originally belong to the collegiate church but come from churches in the Figline district. They include: the large altarpiece by Andrea di Giusto, one of Masaccio’s pupils, that depicts the Adoration of the Magi and is from the Church of Sant’Andrea a Ripalta; and the imposing Trinity with the Virgin by Agostino Melissi (1616?-1683), that, at one time, was in the Church of San Pietro al Terreno, a church particularly rich in works and objects of art. Both paintings were removed from their sites of origin for reasons of security and conservation. 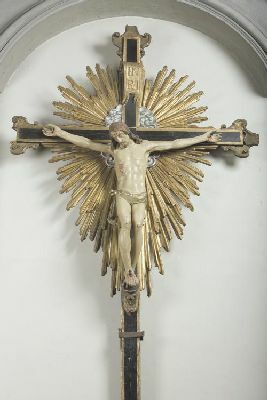 If we do not disturb the activities in the Sacristy, it is worth having a look at, not only the valuable 18th-century counters and wardrobes, but also a beautiful 16th-century wooden Crucifix, an Our Lady of the Sorrows, and the Mourning Saint John attributed to Vincenzo Dandini (1609-1675) and a striking Saint Stanislaus Kostka by the previously mentioned Egisto Sarri. Un pittore del Trecento. Il Maestro di Figline. AA. VV. , Firenze, Editore: SPES, 1980, note: catalogo della mostra. Capolavori a Figline. Cinque anni di restauri. Caneva C., Firenze, Editore: Opus Libri, 1985, note: catalogo della mostra. Arte e restauri in Valdarno. Caneva C., Firenze, Editore: Opus Libri, 1991: note: catalogo della mostra. Size: central panel: 202 cm. x 225 cm. ; predella: 33 cm. x 238 cm. ; fastigium: 22 cm. x 252 cm. This artist was an eclectic painter, also influenced by works of Lorenzo Monaco and the charm of Fra Angelico. In fact, if Fra Angelico’s influence is most evident in the central figures of the altarpiece, the predella contains clear references to Masaccio and Masolino, with evident allusions to the Brancacci Chapel. Size: 38.8 cm. x 27.5 cm. 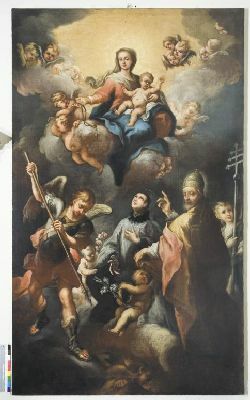 Saint Vincenzo Gonzaga (recto) and the Madonna in glory (verso) are seen on the velvet-cover wooden boards. Size: 195 cm. x 170 cm. The painting was commissioned by the Company of the Passion in San Piero al Terreno in the upper Valdarno in 1657. However, it had still not been delivered by 1674, creating a dispute with the artist. 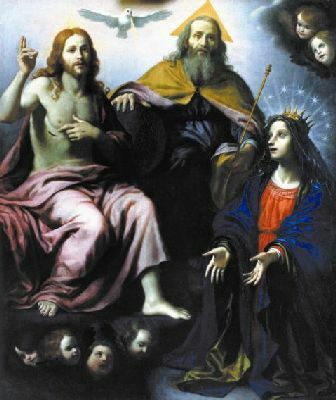 The figures in the grandiose painting have a flat definition, and the search for a resemblance between the Father and the Son cannot be denied. The painting was removed from its original location some years ago for reasons of preservation. Size: 300 cm. x 175 cm. 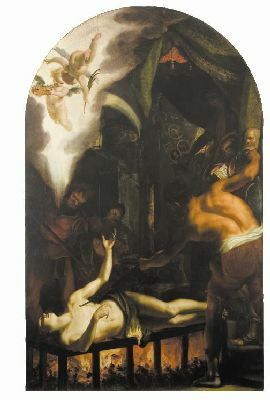 Carried out for the Church of the Company of Saint Lawrence in Figline’s hospital of the same name, this painting remained in its original location until 1783 when it was acquired by the Uffizi Gallery. Passing subsequently to the Museum of San Marco, it was returned to Figline at the beginning of the 1980s. 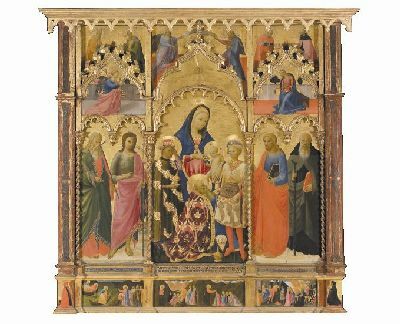 The panel is a fundamental work in Cigoli’s artistic development, a clear indication of his innovative interest in the Venetian use of colour. Size: 172 cm. x 121 cm. 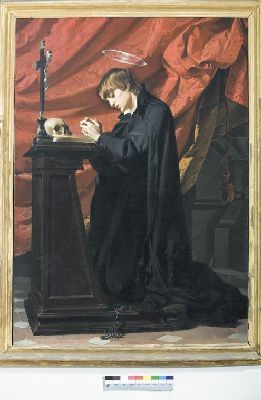 The sumptuous painting, rich in theatrical effects, shows the young Polish saint who, with Saint Aloysius Gonzaga, is one of the more important figures of the Jesuit Order. 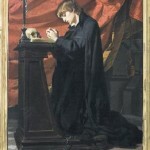 He is presented with his traditional iconographic attributes: a book of prayers, a skull and a Crucifix. Size: small tray stand: cm 7 cm. 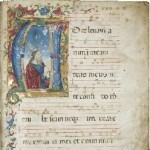 x 11.5 cm. ; sup. diam. 26.5 cm. ; shell: 18 cm. x 6 cm. Highly decorative, these rare and unique articles include a jug paired with a raised tray on a rather soaring foot (small tray stand). The jug was created exploiting the sinuous form of a nautilus, a shell in mother-of-pearl, mounted in filigree to achieve a spectacular effect. Size: 287 cm. x 170 cm. 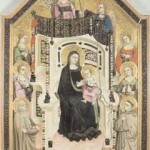 The painting portrays the Madonna with Child seated in Heaven and accompanied by angels. 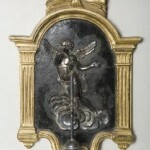 Seen below are Saint Michael, armed with a lance in the act of felling the devil; Saint Aloysius Gonzaga, praying devoutly to the Virgin; and the Holy Father, turned to the faithful, indicating the glory of Mary. Size: 298 cm. x 175.5 cm. 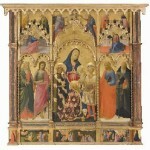 The large cuspated panel is painted in tempera with a gold background. 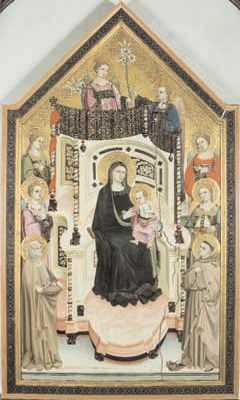 It depicts the Madonna enthroned with Child, Saint Elizabeth of Hungary, Saint Louis of Toulouse and six angels. The artist known as the Master of Figline was an unusual artist with a strong debt to Giotto’s early period. However, he was an “eccentric” follower of Giotto, perhaps not even from Florence, given that some elements in this painting echo Sienese forms. Size: 46 cm. x 34 cm. 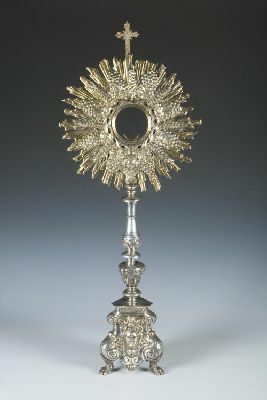 A richly ornate monstrance: the base has opulent volutes framing tablets that, besides the inscriptions, contain the depiction of Saint Michael the Archangel. The stem is decorated with the symbols of Christ’s Passion alternating with cherub heads. The sunburst completes the iconographic repertory with a crown of thorns encircling the display window, from which ears of wheat and bunches of grapes radiate. Size: 24 cm. x 14.5 cm. 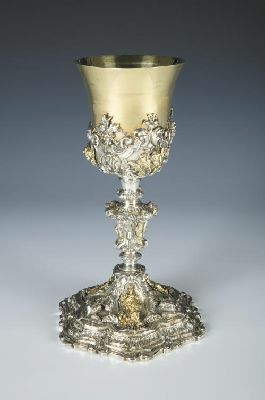 This splendid chalice is decorated with figures and scenes related to the Passion of Christ. On the foot are the figures of the Risen Christ, the Virgin, and Saint John the Evangelist while, on the node, there are scenes depicting Praying in the Olive Garden, the Flagellation, and the Presentation of Christ to the Mob. 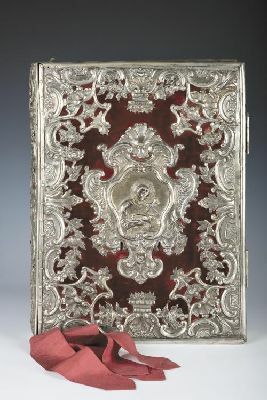 The stamp “800” indicates that it was made after the unification of Italy, using Baroque elements with a typical 19th-century style. 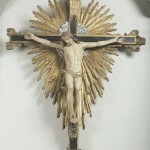 The cross leans against a gilded rayed background with clouds., wearing a loincloth, Christ’s body is anatomically precise and well modelled. Size: support: 34 cm. x 20 cm. ; aspergillum: 15 cm. x 2.5 cm. 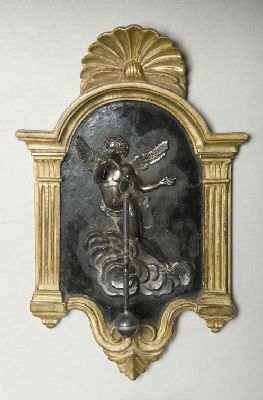 This unique ecclesiastical furnishing is made up of an architecturally-structured wooden frame containing a small relief of an angel in flight, whose full-relief arm supports the aspergillum. The ensemble must have been part of a set with a container for holy water. Size: 484 mm. x 340 mm. 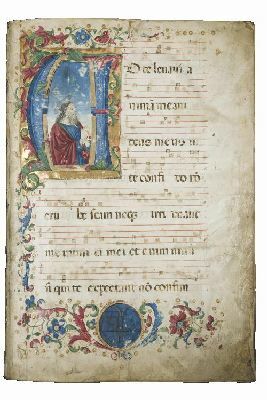 This codex, for the liturgical period from the first Sunday of Advent to Easter, is the first of the two volumes that make up the Gradual. The figure of the prophet in the first page links it closely to the Francesco d’Antonio’s circle. The figures of the codex, however, seem to recall more the young Attavante degli Attavanti’s style during his early years in Francesco d’Antonio’s orbit. Motorway: Exit at Incisa Valdarno on the motorway A1 (Florence-Rome) about 19 km from Florence and 20 km from Arezzo. From the Incisa Valdarno tollbooth, continue for about 6 km towards Figline Valdarno. Road: From Florence, follow the signs to Arezzo along State Road 67. From Pontassieve, continue on State Road 69. The museum is opened upon request.